Schematic of Rosa26-EGFP-L10a allele and experimental work flow. The EGFP-L10a fusion protein was reversely integrated into the Rosa26 locus. Following CRE-mediated removal of the transcriptional stop cassette (3x pA), EGFP-L10a expression is driven by the CAGGS promoter. 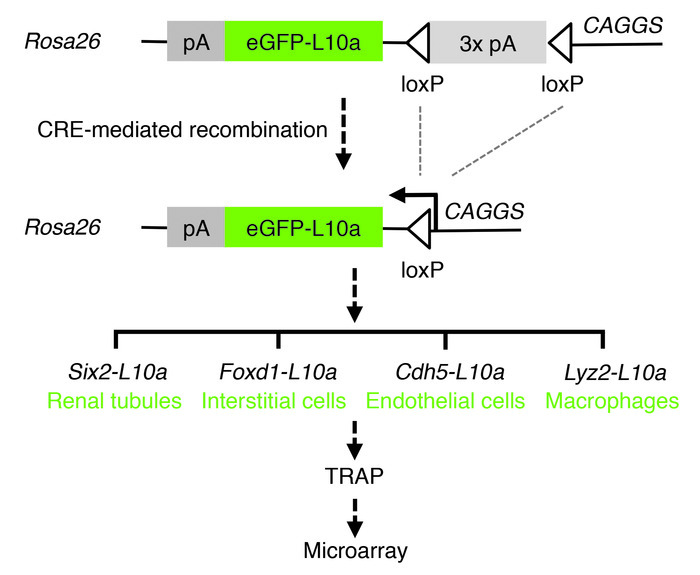 Four different Cre lines (Six2, Foxd1, Cdh5, and Lyz2) were used in this study to drive expression of the transgene in major cellular compartments of the kidney (renal tubules, interstitial cells, endothelial cells, and macrophages, respectively). RNA was isolated using TRAP prior to profiling via microarray.